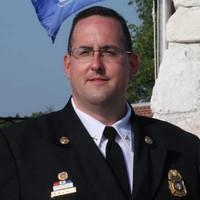 Steven has been the Powhatan County Fire & Rescue Chief since December of 2014. He came to Powhatan with over 30 years of combined volunteer and career Fire and EMS services experience, retiring as an officer with the Fairfax County Fire and Rescue Department. He also has volunteer experience in several Virginia counties including over 20 years in Stafford County. He is an Executive Fire Officer, through the National Fire Academy in Emmitsburg Maryland, a National Fire Protection Agency Fire Officer Level IV, and a National Registered Paramedic. He graduated from the George Washington University with a BS in Emergency Services Management, and also has a background in emergency communications and 911 systems. He sits on the Board of the National Association of Counties representing volunteer and combination departments from across the country. He and his wife DeAnne have been married for 22 years and have two children. Their daughter is attending VCU School of the Arts, while their son is a senior at Powhatan High. Both children are volunteer firefighters in the county.